The unusual separate bell tower of St. Mary the Virgin, Berkeley, Gloucestershire has a graffito ‘H. Ghostly’ cut into it, with ‘1826’ carved very close to it and in a seemingly similar lettering style. I was asked if I could find anything out about the person who carved this inscription. The surname is, fortunately, very rare. 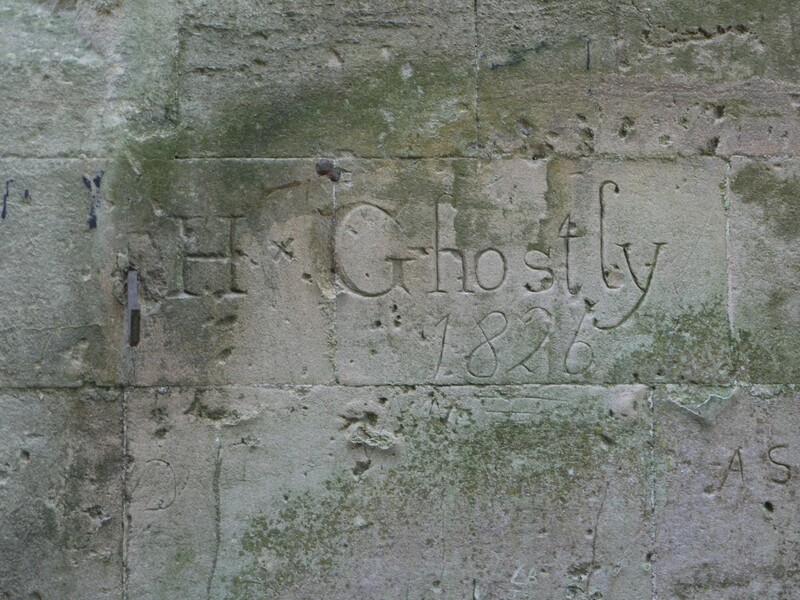 In the 1841 Census (the first UK census to survive almost entire) there are only a handful of Ghostly families and individuals, all spelt Ghostley. This census is available and indexed on both www.findmypast.com and www.ancestry.co.uk, the two major genealogy websites. This shows that all the Ghostleys in England and Wales were resident in Gloucestershire and not only in the county but in either Berkeley or adjacent villages. The spellings Ghostly and Ghostley seem to have been used interchangeably. I then looked at those Ghostleys with a first name beginning with H. I was looking for one who was of an age to be carving his name in 1826, assuming that the similarly-carved date does relate to the name. Searches on ancestry and on the familysearch Latter Day Saints (Mormon) website offered only one possible Henry GHOSTLEY, baptised at St. Mary, Berkley on 14th September1806, son of ‘James GHOSTLEY, Mason’. It seems the carver added his name to the tower when he was about 20. By the 1841 Census, Henry was married to Ann and had two daughters aged 12 and 6 and a son aged 2. They lived in the Tything of Hamfallow, in Berkeley Parish, at Brickhill – appropriate enough as Henry is listed as a ‘brickmaker’. All of them were born in Gloucestershire. Looking for a marriage for Henry Ghostley to ‘Ann’ there was only one possible – a little way off, in Bristol. Was Henry working there when he met her? Henry Ghostley, single man, married Anne Parslow, single woman, on 17 March 1839 at, St. Augustine the Less, Bristol. Their respective fathers were James Tucker Ghostley & William Lawrence Parslow (The General Register Office marriage reference on the national index is: March ¼ 1839 Bristol 11 125 and Bristol Archives reference is Marriages, 1837-1848 (P/St.Aug/R/4/e). This church no longer exists, however it was founded about 1240 and was known as ‘the Less’ to distinguish it from St. Augustine the Great next door – which is now Bristol Cathedral. The church was damaged by Fire in 1940, and was finally demolished in 1962. The site is now under the extension to the Bristol Royal Hotel. By the 1851 Census, Henry and Ann, now aged 44 and 39 years, were in the Hamlet of Oakhanger, still in Hamfellow in the parish of Berkley. He is now described as a ‘Bricklayer and Mason’. With them were three sons (including a Henry junior) and three daughters all born in the parish of Berkeley, except the oldest son (James Tucker Ghostley, then aged 11) who was born in Slimbridge parish. A search of the 1861 Census didn’t reveal anything for them at all. Looking for a death of Henry registered in the past 10 years brought no results either, leaving me with the question of where the family had gone. At this stage of the 19th century emigration was quite likely and a further internet search brought up several indications that the Ghostleys had moved to the USA, settling in Minnesota (MN). The USA also has censuses taken every 10 years – but theirs are in the ‘0’ year not the ‘1’ year. I could not find the family in the 1860 Census but Henry’s son James Tucker Ghostly (1839-1866), now aged 22, joined Company ‘H’ of the 1st Minnesota Infantry, in the Union Army on 2.6.1861 and fought in the American Civil War until 5th May 1864, where he was wounded at the First Battle of Bull Run on 21.7.1861, soon after enlistment. By the 1870 census, Ann was widowed and the family were living in Hassan, Hennepin County, Minnesota, USA. There was a son with her, Charlie (Charles James) Ghostly, born in Minnesota and aged 14, meaning the family had been in the USA since about 1855-6. I then looked on a huge website called Find-a-grave, which has excellent coverage in the USA. This gives a death date of ‘1868’ (I cannot refine this at present) and grave details with a photo for Henry Ghostley’s grave in Saint John’s Episcopal Cemetery, Rogers, Hennapin County, Minnesota. His wife, Ann died on 23 July 1890 in Anoka County, Minnesota but is buried with her husband and there is a photograph of her gravestone on this site. A search of all births, marriages and deaths registered in England and Wales from mid-1837, using the FreeBMD website, shows that, aside from Henry’s 1839 marriage in Bristol and the death, in 1870, of an Ann Ghostly aged 61 in Gloucester registration district, the only registrations are in Thornbury registration district, with Ann’s 1870 death the last entry of any sort for Ghostley/Ghostly. In other words, the Berkley-area Ghostleys are the only family with this surname by the mid 19th century. When they left for America, the surname soon became extinct in this country. By contrast there are quite a few Ghostleys in the USA today, still chiefly in Minnesota. Heenepin County is now, effectively, a suburb of Minneapolis.